ulation of K+ channels by O2 tension has been demon- strated in rabbit .... The brain was removed rapidly, chilled in 0â4Â°C. Ringer's ... using symmetrical 140 mM KCl on both sides of .... (TEA, 1 mM) did not block the BKCa currents when it. Sophie S.W. Wang,1 Shuiping Tu,1 Shanisha A.K. Gordon,1 David Mark Pritchard,2 Andrea Varro,3 ...... man, J.F., and Cohen, S.M. 2007. A 90-day dietary. 77, No. 8, pp. 4435-4438, August 1980. Biochemistry. Quercetin inhibits Ca2+ uptake but not Ca2+ release by sarcoplasmic reticulum in skinned muscle fibers. 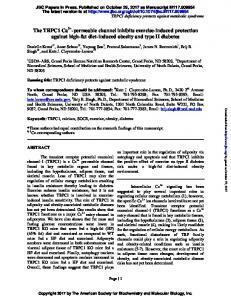 Oct 27, 2017 - autophagy and apoptosis and that TRPC1 inhibits the positive effect of exercise on type II diabetes risk under a high-fat diet-induced obesity. Sep 6, 2017 - evoked by activation of histamine H1 receptors. ... We demonstrated previously that histamine, through H1 receptors, stimulates an increase. Vol. 266, No. 33, Issue of November 25, pp. 22246-22253,1991 Printed in U.S. A . 1991 by The American Society for Biochemistry and Molecular Biology, Inc.
* The costs of publication of this article were defrayed in part by the payment of page charges. This article must therefore be hereby marked “aduertisement” in accordance with 18 U.S.C. Section 1734 solely to indicate this fact. $ T o whom correspondence should be sent. serine; TG, triacylglycerol; protein kinase C, Ca2+-activated, phospholipid-dependent protein kinase; protein kinase A, cyclic AMPdependent protein kinase; TPA, 12-0-tetradecanoylphorbol-13-acetate; IP:3,inositol trisphosphate; HEPES,4-(2-hydroxyethyl)-l-piperazineethansulfonic acid EGTA, [ethylenebis(oxyethylenenitrilo)]tetracetic acid HR, HEPES-bufferedRinger’s solution. Cholecystokinin and PC Synthesis in Pancreatic Acini actions of hormones or mitogens in a number of cell types (9). with or withoutsecretagogues for the indicatedtime. The incubations were terminated by centrifugation in the microcentrifuge, and pelleted acini were extractedwith 3 ml of ch1oroform:methanol:HCI a (1:2:0.02, v/v) mixture. [3H]Choline-labeled PC and choline metabolites were analyzed as described above. For the separation of phospholipids from ['H]myristic acid-labeled acini, PIP, PIP,, PA, and P E were separated on potassium oxalate-impregnated TLC plates using ch1oroform:methanol:acetone:acetic acidwater (40:15:15:12:8, v/v) as a solvent system (18)PC, PI, PS, lyso-PC, and sphingomyelin were separated with the solvent system ch1oroform:methanol:acetic acidwater (50:30:8:4, v/v). Neutral lipids from acini were also separated using the solvent system hexane:ethyl ether:acetic acid (7030:2, v/v) (19). For labeling aciniwith ['H]choline forlongerperiods,freshly prepared acini were suspended in RPMI 1640 medium supplemented with 10% heat-inactivated fetal calf serum, 100 units/ml penicillin, 0.1 mg/ml streptomycin, and 0.02% soybean trypsin inhibitor. Acini from one pancreas were suspended in 50-75 ml of culture medium and incubated with2 pCi/ml ['H]choline in a six-well plastic dish at 37 "C under an air atmosphere containing5% CO,. When acini were labeled under this condition the incorporation of [3H]choline into phospholipid of acini reacheda plateauafter 18-24 h (datanot shown). Analysis of phospholipid extracted from these labeled acini by TLC showed that 95 k 2% ( n = 3) of the label was PC. For the determination of PCdegradation, labeled pancreaticacini were washed twice with fresh HR buffer, and then 1-ml aliquotsof labeled acinar suspension were incubated with or without1 nM CCK8 for the indicated time a t 37 "C. The incubations were terminated by centrifugation a t 10,000 X g, and 0.8 ml of each supernatant and pellet suspended in 1 ml of water was extracted with 3 ml of the chloroform:methanol(1:2) mixture. After the additionof 1 ml of chloroform and 1 ml of water, the aqueous phase extracted from medium and organic phase extracted from cells were counted to determine the release of ["Hlcholine metabolites into the medium and ["HIPC in acini, respectively. Assuy for Enzyme Activity-After acini were incubated with 1 nM CCK8 for 60 min, the acini were washed twice with ice-cold saline and suspended in 2 ml of ice-cold homogenization buffer containing 10 mM Tris-HC1 (pH 7.4),154 mM NaCI, 1 mM benzamidine, and 0.1 phenylmethylsulfonyl fluoride. In some experiments0.1 mM vanadate and 1 mM NaF were also included in the homogenization buffer. All subsequent procedures were performed a t 4 "C. Acini were homogenized by 50 strokes of a tight fitting Dounceglass homogenizer. This homogenate was centrifuged a t 500 X g, for 10 min, and the pellet was homogenized again and spun. The supernatants were combined andthen centrifuged at 100,000 X g for 60min.Theresultant supernatant andpellet were designed as thecytosolic and particulate fractions, respectively. The cytosol was concentrated further with Centriprep-10as recommended by the supplier, andtheprotein concentrations of both cytosolic and particulate fraction were determined by usingBio-Rad protein assay reagent. Reactions were carried out for 20 min a t 37 "C andused a boiled enzyme as a blank. Choline kinase activity was assayed as described previously (20). Briefly, the reaction mixture contained 100 mM Tris-HC1 (pH 8.0), 10 mM MgCI,, 10 mM ATP, 0.2 mM dithiothreitol, 0.25 mM ["HI choline chloride, and 0.2-0.3 mg of protein in a final volume of 0.1 ml. CTP:phosphocholine cytidylyltransferase activity was assayed by the methods asdescribed previously (21). The reaction mixture contained (in a total volume of 0.1 ml) 50 mM Tris-HC1 (pH7.4), 20 mM MgC12, 5 mM CTP, 1.5 mM ['4C]phosphocholine, and 0.4 mg of protein. For choline kinase and cytidylyltransferase assay reactions were terminated by placing the reaction tube into a boiling water bath for 2 min, and a standard containing choline, phosphocholine, and CDP-choline was added. Samples were analyzed by TLC using the solvent system methanol:0.9% NaCI:NH:IOH (50:50:5, v/v). Phosphocholine transferase activity was measured by incubating 50 mM Tris-HC1 (pH 7.4), 10 mM MgCla, 0.4 mM ["CICDP-choline, 0.08 mM 1,2-diacylglycerol, and 0.4 mg of protein in a total volume in 0.8 ml as described previously (22). Diacylglycerol was dried under an N2 stream and resuspended in the incubation mixture by sonication for 10 min. The reaction was terminated by the addition of 3 ml of a chloroform:methanol:HC1 (1:2:0.02, v/v) mixture. The organic phase separated asdescribed above was dried under nitrogen inliquid scintillation vials, and the radioactivitywas measured. In the experiment examining theeffects of Ca2+ on cytidylyltransferaseactivity, different free Cas+ concentrations were obtained by altering the Ca"
to EGTA ratio using a computer program as described previously (23). The results presented are the means k S.E. of three ormore experiments unless otherwise stated.Statistical analysis was performed by Student's t test. FIG. 2. Pulse-chase study on the metabolism of [3H]choline in pancreatic acini and the effects of CCK. Acini were pulsed with 2 pCi/ml [3H]choline for 30 min and resuspended in medium without radiolabel. Labeled acini were then chased with (0)or without (0)1nM CCK8 for the indicated times. The radioactivity in [3H] choline metabolites and [3H]PC was determined by TLC. A, choline; B, phosphocholine; C, CDP-choline; D, PC. The radioactivity of [3H] PC observed at the beginning of the chase period was subtracted. Each value was determined in duplicate, and the result shown is representative of three separate experiments. FIG. 3. Concentration-dependent inhibition of PC synthesis induced by Ca2+-mobilizingsecretagogues in acini. Acini pulsed with 2 pCi/ml [3H]choline were resuspended and incubated with increasing concentrations of CCK8 (O),carbamylcholine (CCH) (O), and the Ca2*ionophore A23187 (A) for 60 min. [3H]Choline-labeled PC was then extracted, and its radioactivity was determined. From each value the radioactivity observed at zero time was subtracted. Values were expressed as thepercentage of control value and are the mean f S.E. of three separate experiments. FIG. 1. The effects of CCK on the incorporation of [3H] choline into water-soluble choline metabolites and PC in acini. Pancreatic acini were incubated with 2 pCi/ml [3H]choline in the presence ( 0 )or absence (0)of 1 nM CCK8 for the indicated times. Labeled acini were washed twice, and the radioactivity incorporated into total choline metabolites and PC was measured. Each value was determined in duplicate, and the result shown is representative of three separate experiments. TABLEI1 in Acini-Since carbamylcholine,bombesin, and the Ca2+ Effects of calmodulin antagonists or protein kinase C inhibitors on ionophore A23187 are considered to stimulate digestive enCCK-induced PC inhibition of PC synthesis in acini zyme release from pancreatic acini via an intracellular mechAcini pulsed with 2 pCi/ml [3H]cholinefor 30 min were incubated anism similar to that of CCK (l),we next examined the or without 1 nM CCK8 for 60 min in the presence or absence of effects of these pancreatic secretagogues on PC synthesis in with various inhibitors. [3H]Choline-labeled PC was then extracted, and acini. As shown in Fig. 3, carbamylcholineinhibited PC the radioactivity was determined. For each value the radioactivity synthesis in a concentration-dependent manner. 100 p~ car- determined at the beginning of the chase period was subtracted. bamylcholine inhibited PC synthesis 44.0 to +. 2.0%of control Values were expressed as thepercentage of control value and are the ( n = 5) at 60 min; this maximal effect was similar to that of mean f S.E. for the number of experiments shown. Neither calmodCCK. The Ca2+ ionophoreA23187, which stimulate amylase ulin antagonists nor protein kinase C inhibitors alone significantly release by mobilizing Ca2+(l),also inhibited PC synthesis in affect PC synthesis in control acini (data not shown). No. of [3H]PC a concentration-dependent fashion, and3 p~ A23187 reduced Agents experiments synthesis P C synthesis to46.4 f 3.6% of control ( n = 4) at 60 min (Fig. % of control 3). In addition,100 nM bombesin reduced PC synthesis (Table CCK8 (1 nM) 5 37.6 f 2.3 I). When combined with 1nM CCK8, which showeda maximal 4 47.0 f 2.0 CCK8 + W-7 (10 pM) inhibition of PC synthesis, neither 100 p~ carbamylcholine 4 CCKS + W-7 (100 pM) 90.4 k 3.6 nor 3 p~ A23187 induced a n additionalinhibition of PC CCK8 + W-5 (10 p M ) 3 38.7 f 3.9” synthesis(TableI), suggesting that these Ca2+-mobilizing 3 52.0 rt 4.0 CCKS + W-5 (100 p M ) secretagogues inhibit PC synthesis by the same mechanism. 38.5 rt 4.0” 3 CCK8 + staurosporine (100 nM) CCK has been considered to stimulate protein kinaseC acti3 CCK8 + H-7 (100 p M ) 39.5 f 3.0” vation (1, 6, 7); however, neither 100 nM nor 1 p M TPA, a NS uersus 1 nM CCK8. potent activatorof protein kinaseC (5), had anyeffect on PC synthesisinacini a t 60 min(TableI).Furthermore,no significant change in PC synthesis was observed when labeled induced amylase release from pancreatic acini (26), did not of PC synthesisinduced by CCK8 (Table acini were incubated with 100 nM TPA for 0-120 min (data affect the inhibition not shown). Secretin and dibutyryl CAMP, which stimulate 11). In addition, 100 p~ H-7, another protein kinaseC inhibamylase release via a CAMP-dependent pathway (l),had no itor (27), also had noeffect on CCK-induced inhibitionof PC effect on PC synthesis (Table I). These data, therefore, sug- synthesis (Table 11). Thus, the resultssuggest that the Ca2+gest thatCCK and carbamylcholinemay inhibit PC synthesis calmodulin dependent pathway may be involved in this inhibition. in pancreatic aciniby a Ca2+-dependent mechanism. 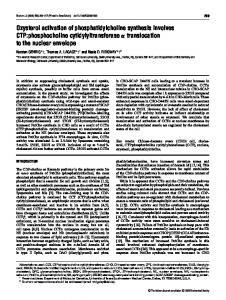 Studies were also performed to determine whether CCK Reversal of CCK-induced Inhibition of P C Synthesis by stimulated the degradationof PC by using acini labeled with Calmodulin Antagonists but Not by Protein Kinase C Inhibi[3H]choline for 24 h to equilibrium as described under “Methtors-To investigate further the mechanism underlying CCKods.” When these labeled acini were incubated with 1 nM induced inhibition of PC synthesis, the effects of calmodulin CCK8 for 60 min, CCK failed to induce an increase in the antagonists on the reduction of PC synthesis induced by CCK [3H]choline metabolites released in themedium or a decrease in aciniwere studied. As shown in Table 11, W-7, a calmodulin in [3H]PC in acini when compared with control acini (data antagonist (24), reversed CCK8-inducedinhibition of PC not shown). Thus, PC breakdownmay not contribute to the synthesis in a concentration-dependent manner. In addition, inhibition of PC synthesisinduced by CCK in acini. W-5, another calmodulin antagonist (24), also reversed the Effects of CCK on the Enzyme Activity via the CDP-Choline inhibitory effect of CCK8 on PC synthesis although W-5 was Pathway-To determine whether the treatment of CCK alters much weaker than W-7 in these experiments (Table 11). On the activitiesof enzymes involved in the denouo synthesis of the other hand, 100 nM staurosporine, a protein kinase C PC via the CDP-choline pathway, the activities of enzymes inhibitor (25) that has been shown to inhibit CCKor TPA- prepared from control and CCK-treated acini were assayed. Experiment 1 Cytosolic Control ( n = 4) 0.73 rtr 0.05 CCK8 ( n = 4) 0.41 rtr 0.06" (56) Particulate Control ( n = 4) 0.57 rtr 0.06 CCK8 ( n = 4) 0.43 k 0.04b(75) Experiment 2 Cytosolic 0.70 k 0.06 Control ( n = 4) CCK8 ( n = 4) 0.29 rtr 0.04' (41) CCK8 + W-7 ( n = 4) 0.65 rtr 0.06 Particulate 0.55 -+ 0.05 Control ( n = 4) CCK8 ( n = 4) 0.28 -+ 0.04"(47) CCK8 + W-7 ( n = 4) 0.50 rtr 0.06 a Significantly different than control ( p < 0.005). Significantly different than control ( p < 0.05). Significantly different than control ( p < 0.0005). TIME ( rnin ) FIG. 4. Effects of CCK on the incorporation of [3H]myristi~ acid into PC and DAG in pancreatic acini. Acini were labeled with 5 pCi/ml [3H]myristic acid for 30 min. Labeled acini were resuspended and then incubated with (0)or without (0)1 nM CCK8 for the indicated times. [3H]Myristic acid-labeled PC and DAG were extracted and analyzed by TLC. The radioactivity of [3H]PC at zero time was subtracted from each value, Values are the mean of duplicate determinations, and the data shown are representative of three separate experiments. Report "Cholecystokinin Inhibits Phosphatidylcholine Synthesis Via a Ca2+ ..."